Sgt. 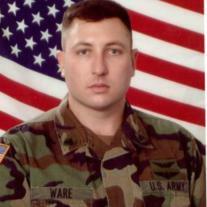 1st class Matthew Ty Ware, age 40, of Columbus, peacefully passed away after a long courageous battle with Leukemia and complications from a viral infection. Matt was born in Urbana, OH on April 20, 1972. He was a loving, caring, and spiritually uplifting husband, son, brother and friend. He received his Bachelor of Construction Management from Capitol University. Matt joined the USMC after High School and served as helicopter crew chief for 6 1/2 years in Hawaii before returning to Columbus. Most recently, he was an Active Duty Ohio Army National Guard NCO at Rickenbacker. He was with the 1-137th Aviation Battalions. Matt is survived by his loving wife, Christina; sons, Ryan Xavier, William Gabriel, and Erik Matthew Ware; father, W. Mac (Helen) Ware; mother, Sandi (Reno) Lippel; sister, Ami (Rob Berger) Papadopulo; niece, Sadie Papadopulo; mother-in-law, Doris Johnson; and many extended family and friends. A special thank you is extended on behalf of the family to Dr. Bill Blum, Jill Beavers CNP, John Hinkle CNP, Army National Guard, Major Thomas, Sgt. Hoover, Sgt. Camacho, and all the staff and nurses at James Cancer Hospital Hematology Unit for their unwavering support and compassion. Friends may call from 2-4 p.m. and 6-8 p.m. on Thursday, April 26, 2012 at the SCHOEDINGER NORTHWEST CHAPEL1740 Zollinger RD., where the funeral service will be held at 9 a.m. on Friday, April 27, 2012. Rev. Molly Cameron officiating. Interment at Dayton National Cemetery 1p.m. In lieu of flowers, contributions in Matt’s memory may be made to the Leukemia and Lymphoma Society of America- Central Ohio Chapter, 2225 Citygate Drive #E, Columbus, OH 43219. Visit www.schoedinger.com to share a favorite memory of Matt.